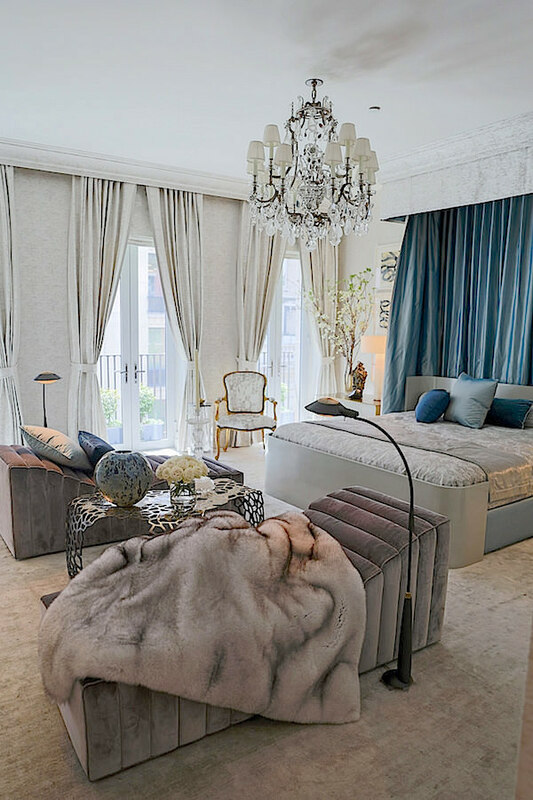 Inspiration for the Drake Anderson Kips Bay bedroom began on a trip the design partners took to London, where a state bed at the Victoria & Albert Museum captured their attention. Featuring the classic upholstery technique of gainage, the bed had all its intricate furniture details wrapped in fabric. 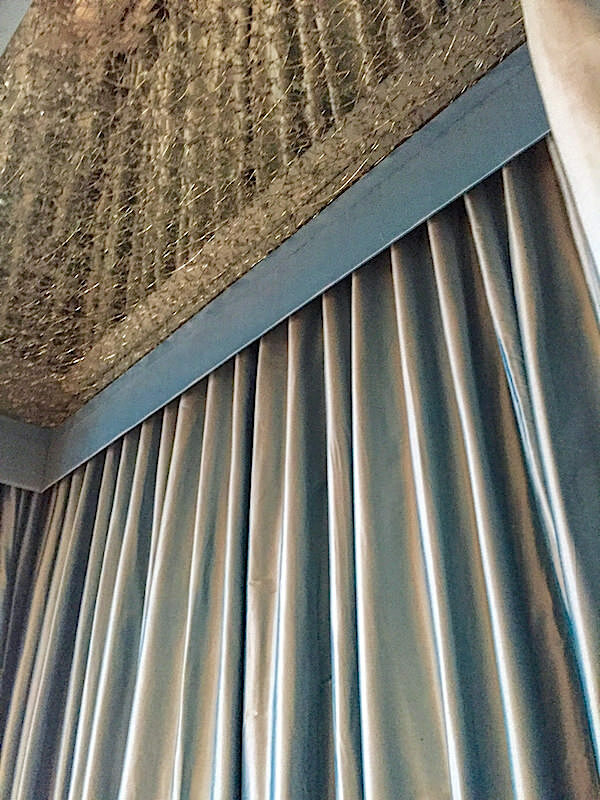 Wanting to interpret this traditional technique in a contemporary way, Jamie Drake and Caleb Anderson worked with Jouffre to swathe their room in quiet elegance, using a single Romo fabric to cover the moldings, upholster the walls and as drapes, bed hangings and valance. and the chaise lounges, which explore sculptural channeling, a design element having its moment. 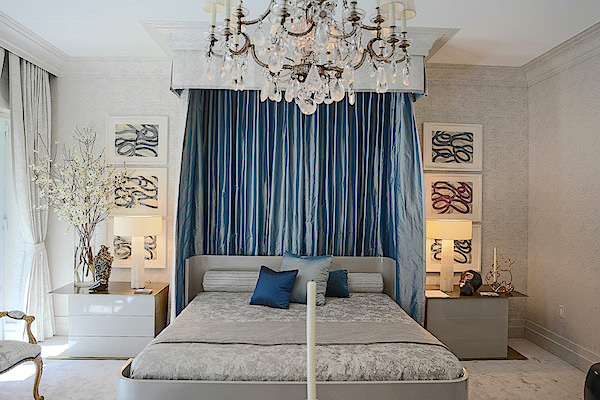 The traditional tester over the bed conceals a jewel box surprise underneath of crackled mirror, offering a secret detail of sparkling glamour. 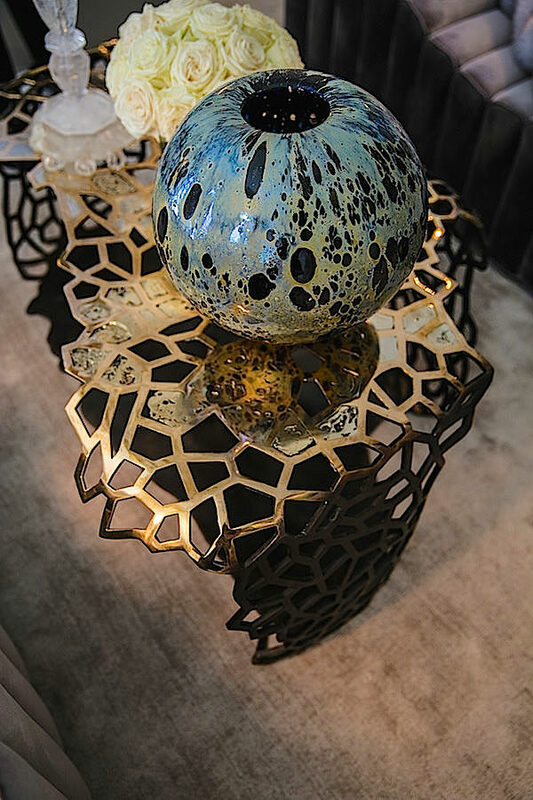 Antiques and creations by modern artisans are juxtaposed for a sophisticated expression of old and new. A beautiful antique Bagues rock crystal chandelier from Marvin Alexander hangs over a stunning David Wiseman white bronze Lattice Table. 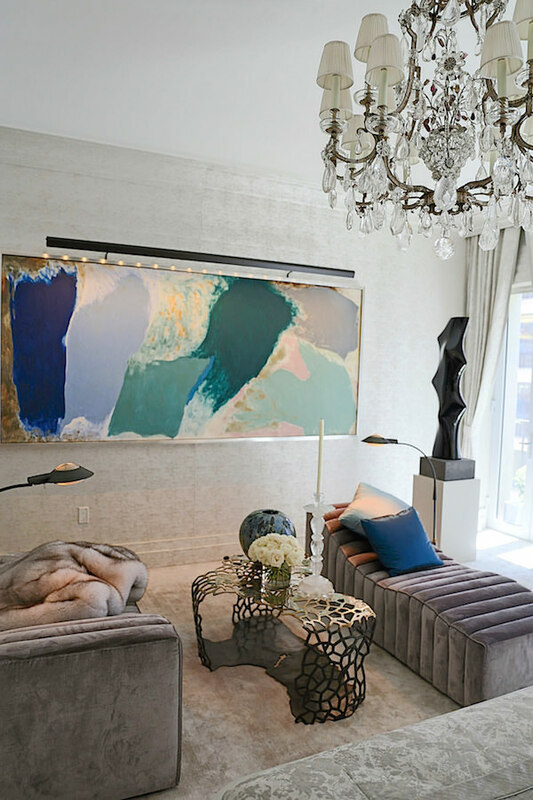 A painterly 1980s Friedel Dzubas work, echoing the cool hues of the room, sits next to the sleek organic lines of a Saint Clair Cemin obsidian sculpture. 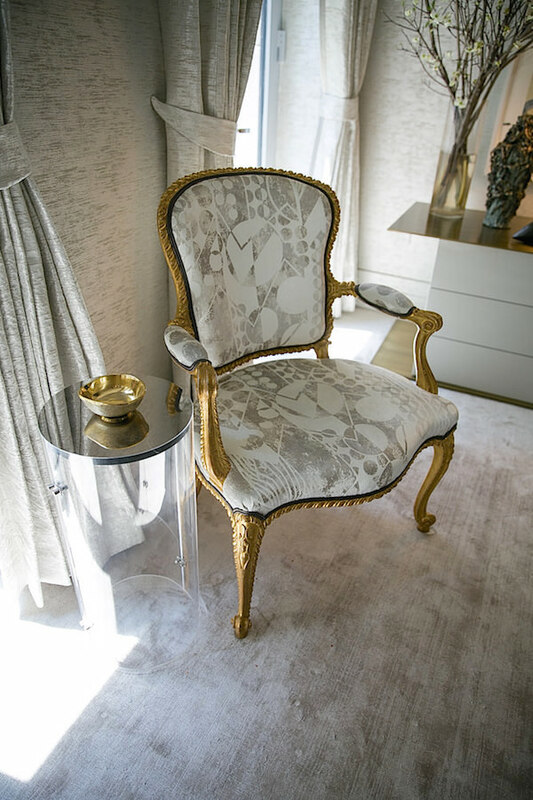 An 18th century Hepplewhite gilt armchair from Clinton Howell is updated with the modern chic of Pierre Frey’s Paquebot from the new Charleston collection. In a subtle play of form and proportion, the over scaled H.M. Luther mirror reflects the tonal curves of the room. Luxurious pattern, materials and ornamentation create a vivacious visual dialogue throughout with thoughtful and creative pairings. 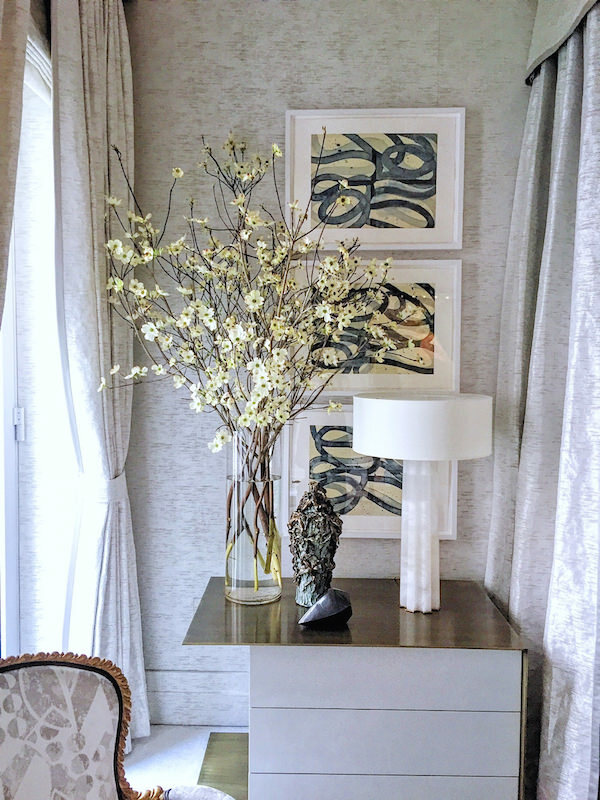 Just like with their new design partnership, Jamie and Caleb have merged their aesthetic viewpoints in their Kips Bay bedroom, creating a luxurious and layered marriage of tradition and modernity. This entry posted in architecture, art, furniture, interior design. 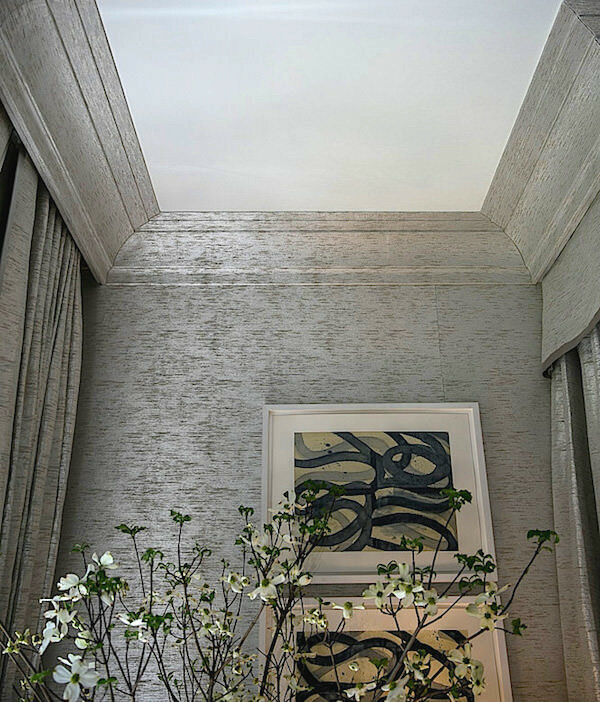 Entry Tags: Caleb Anderson, Drake + Anderson, Jamie Drake, Kips Bay bedroom, Kips Bay decorator show house, Kips Bay Show house Bookmark the permalink. The space and your photography is incredible! 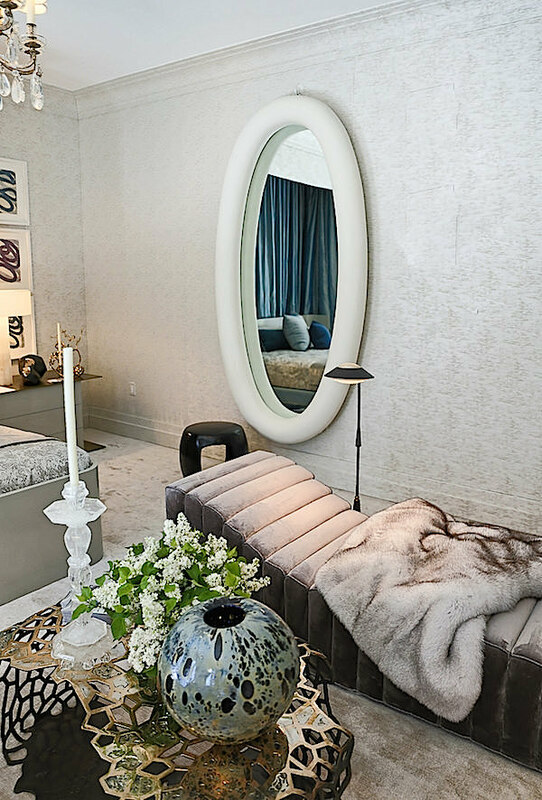 I have loved reading about each of the Kips Bay rooms you’ve covered. Your photographs captured the essence of the rooms beautifully! 81 queries in 0.878 seconds.